Graeme Mackie - Deer, Pigs, and a Little Bit of Bull! 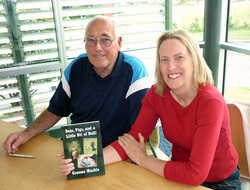 Graeme with his book coach Bev Robitai at the launch of Deer, Pigs and a Little Bit of Bull! on November 5th. Graeme sent the manuscript in around the beginning of August, for assessment and a quote for publishing. After a few weeks of editing and proofreading, the book was ready for its final layout and the cover design. We organised print quotes, obtained an ISBN, viewed a proof copy, and it hit the presses in early October. 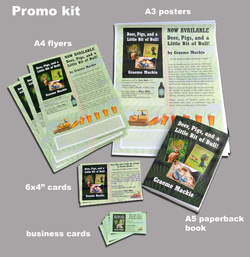 Since then Graeme has been busy showing the book to everyone he chats to, and prelaunch sales left him with only a limited amount of stock on hand! The launch was very successful with the last person to leave buying the last copy left. It is also available as an ebook on Smashwords and Amazon to reach an international audience which will be increasing exponentially as ereaders and Kindles become common household items. (How many people do you know getting one this Christmas? I know it's on my wish list!) It is available worldwide in print on demand via CreateSpace, so readers anywhere can have a copy sent straight to them from the printer.